Started in 2008 in New York City, CreativeMornings is a breakfast lecture series for creative people, open to anyone and free to attend. Attendees are treated to breakfast and a short talk one Friday morning every month. Today, it has grown to 58 chapter cities that host CreativeMornings talks every month, all organized by volunteer members and all around the same global theme. In September, after a successful Kickstarter campaign that gathered donations from 1,200 individuals, CreativeMornings launched their new web presence. The first interactions with it make it feel friendly and easy to navigate. The homepage has a very clear message that includes an introduction to the program, the latest global theme and the upcoming events. 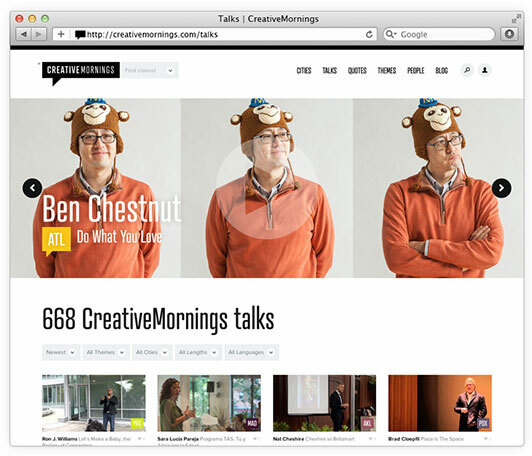 Comparing this site to other talk-centric websites such as TED or BigThink, we can see that CreativeMornings has focused more on content and left unnecessary, flashy elements aside. 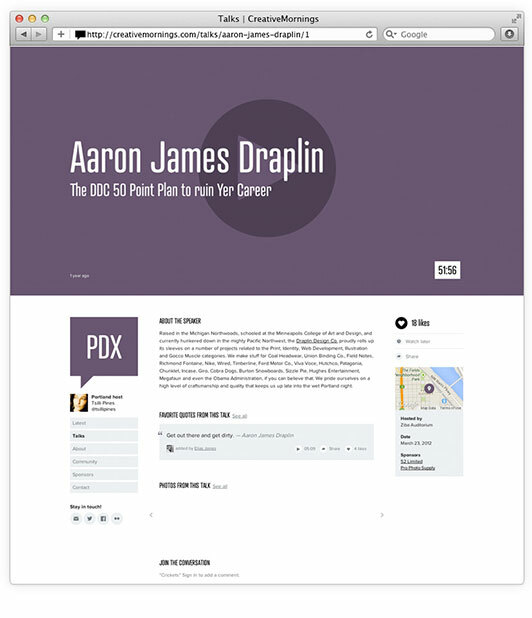 The presentation of the homepage is clear, modern and concise; nothing feels over the top and all of the content serves a purpose, even the section below the fold that displays all of the social media content. This area helps showcase the community aspect that has helped CreativeMornings grow throughout the years. I’ve followed CreativeMornings primarily as a source of creatively inspiring talks, which makes the complete archive of every single talk a perfect place to start digging into the site. The ‘Talks’ page offers a comprehensive filtering system that allows users to separate talks by different search criteria, including: Themes, Language and Location. Once the user clicks on a specific talk, we are treated to a large viewing area above the fold, and below more details about the talk including the Chapter, a short bio of the speaker, and technical details of that particular day such as location, date and sponsors for the day. Another aspect that separates CreativeMornings from other conference-like events is the sense of community. The new website encourages users to sign up and be part of a global network of attendees. Users can tag quotes, share talk photos, and post comments on each individual talk page. You can also create a profile, follow other attendees, and save talks to watch later. Overall, CreativeMornings a beautiful site full of vibrant colors and a great contrast between images and complementary elements. The City chapters are color coordinated, with their own three-letter code. Built with responsive technology, the site degrades perfectly across mobile devices, with only slight changes in the navigation. 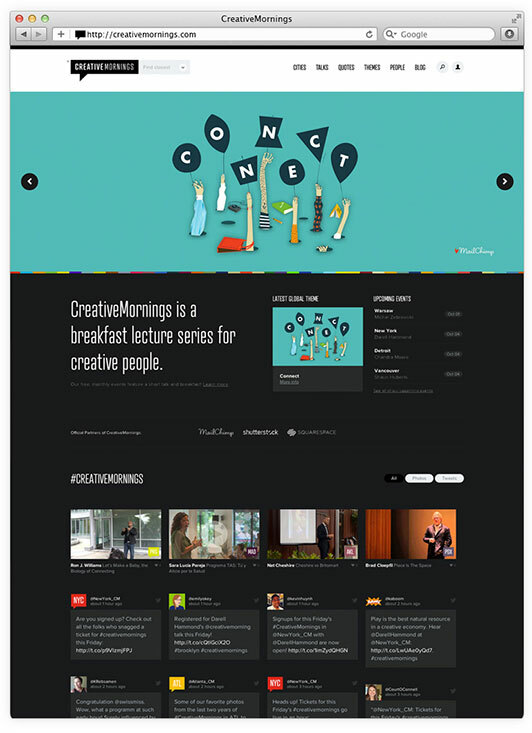 After what I would consider a successful redesign, CreativeMornings now has a web presence that pairs well with the great content they have providing creative individuals for the past five years.